Something amazing happened on our very own street over the weekend involving Max, a bike and a left turn. Sometimes, I trot next to him as he cruises around the neighborhood and he thinks it's really funny to speed up and make me go fast. Mostly, he pedals up and down our street, back and forth and back and forth. He can do this for a really long time. So I was sitting on our porch as he biked and all of a sudden I didn't see on him on the street. "Max!" I shouted, nervously. "Yeah!" he said. I spotted him a few driveways over from ours and headed over. One of our neighbors has a long gravel driveway, and Max had decided to go down it. Maybe this doesn't seem like a big deal, but it was. 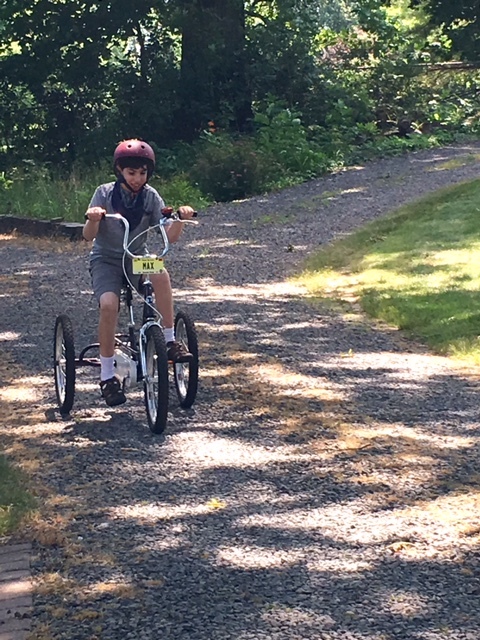 For the first time in Max's bike-riding career, he had veered from his usual path and set off to explore a new one—of his own accord. Being curious and adventurous are great assets in life. For years, though, Max's aversion to noise and crowds meant he was adverse to checking out new places, new restaurants, new anything. Those sensory issues have abated and now he's game to go exploring with Dave. He just doesn't often get the chance to do so on his own, because Dave or I are always with him. There Max was, happily rolling along unfamiliar territory. It was exciting to see, and also made me realize that we need to figure out more ways to let Max safely explore on his own. He's not yet a boy who can, say, cruise around the mall with friends, but I could set up a hangout with one and keep my distance behind them. He needs to gain independence. I need to let go. Sabrina would agree; I can be overprotective of her, too. We were at the zoo the other day with one of her friends, and the girls went ziplining. Sabrina soared over my head first. I saw her safely land, but a few minutes later, she hadn't met me in the waiting area. "Sabrina!" I shouted. "Sabrina!" A minute later, she appeared, embarrassed that I'd been calling for her. Turns out that it was a bit of a walk back. Children develop, and parents need to as well. Giving Max more freedom is a little challenging and a lot unnerving—for me. But it needs to happen, and I know it. Max gave me a great big smile when he saw me. And then, he turned around and went back again. This is REALLY HUGE! And worth celebrating! Self Determination - the secret sauce of a great life - being exercised right here! Awesome, Max!!! Thanks for celebrating this with me!!! My parents do the EXACT SAME THING. They get nervous about me going on thrill rides even though more people are killed by falling out of bed and/or crossing the street. I can understand that! Do you like amusement parks, Anna? YES. The bigger/faster/steeper, the better. I enjoy your blog. I have a 10-year old grandson on the autism spectrum; non-verbal, low muscle tone. I was thrilled to see a picture of Max on his bike and was wondering where I might find something like that. 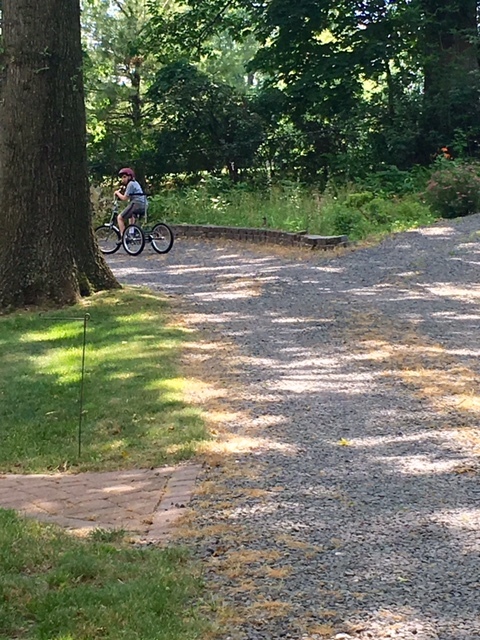 My grandson is always wanting us to push him on his sister's bike, but as he gets older, it's pretty difficult. I think he'd be able to do a bike like Max's. Is it incredibly expensive? Way to go, Max! This gives me great hope that my daughter may one day overcome her anxieties and aversion to crowds and noise too! It would be so nice to burst out of the bubble our life is in currently! Sheila, how old is your daughter? Every child evolves at their own pace (as we all well know)! It took Max years to overcome those anxieties. Noise-reducing headphones really helped him. I feel your pain. We could only go to this one restaurant near us for years, and we always had to sit in the booth all the way in the back, by the bathroom, the only one Max would tolerate. She is 11, will be 12 in September. Unfortunately she won't wear headphones. It took us years to get her to wear a hat in the winter! I have followed you and Max for a long time and have always been in awe of you and Max is my hero! I love watching him grow in every way!